I recently bought an iPad3, primarily to use electronic flight-planning tools and digital charts in the cockpit. As instrument-rated pilots know, a typical trip involves lugging several binders or volumes of instrument procedure charts, plus en route charts, backup sectional charts, and at least one volume of the A/FD. Flights usually cross several chart boundaries, requiring pilots to juggle and refold large maps in crowded cockpits. Part of a typical low-altitude IFR en route chart published by FAA AeroNav Products. Apps for the iPad have transformed the cockpit, just has electronic publishing is revolutionizing the way people read books and periodicals. 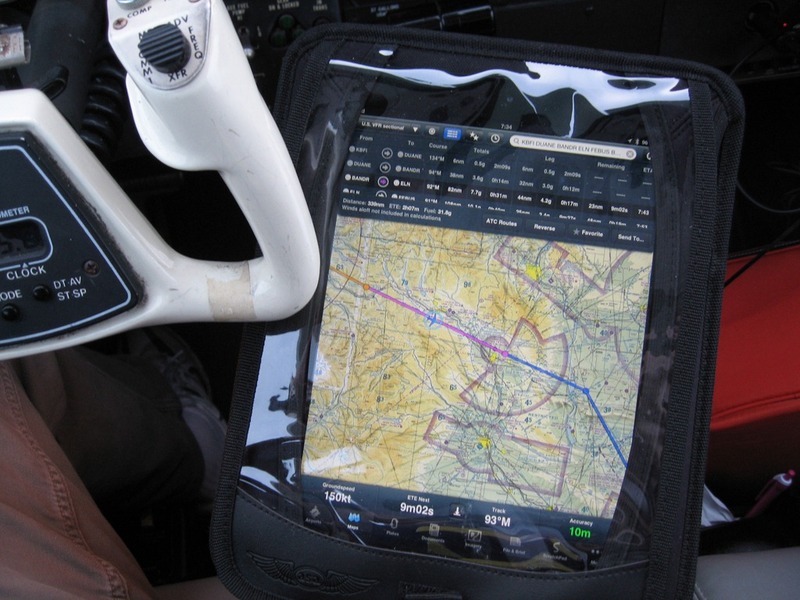 Pilots are rapidly turning to products like ForeFlight and WingX to go paperless and use an electronic flight bag (EFB). Airlines are also getting on board. 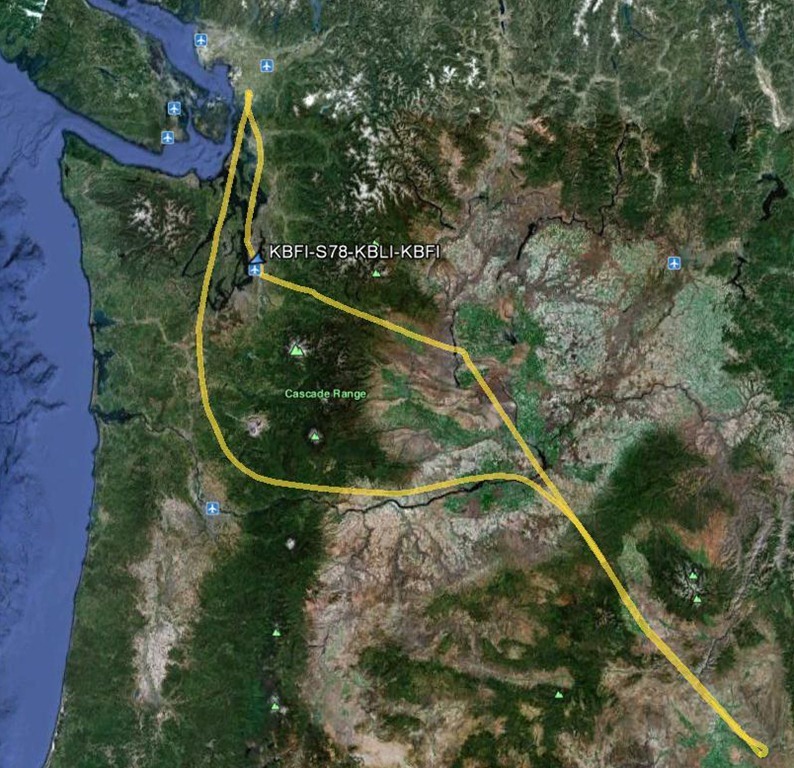 A Pilots N Paws flight on March 24 gave me a great chance to try the new gizmo and software under VFR, and as it turned out, the long round-robin flight (KBFI-S78-KBLI-KBFI) proved the value of an EFB when weather over the Cascades argued for change of route. GPS track of the 900 nm flight as shown in Google Earth. For more information about recording and displaying GPS tracks, see the June 2010 issue of AOPA Flight Training magazine. I fly an A36 Bonanza. It’s equipped with a GNS 530W IFR-approved GPS, and I also carry a Garmin GPSMap396 as a backup and to display weather reports, forecasts, and NEXRAD imagery received via SiriusXM. I’ve now added an iPad3 (64GB with Wi-Fi and 4G), which I use with an ASA iPad Kneeboard that features an easel that tilts the iPad at a handy angle or collapses to allow the tablet to lie flat. The ASA kneeboard also includes a transparent flap that protects the iPad screen while allowing you to control the device with its snazzy touch interface. On this trip, I used the latest version of ForeFlight (I’ll test other products on future flights). I set up my cockpit as shown below as I cruised en route. Although from this angle, the transparent flap on the kneeboard seems to exacerbate reflections from the iPad’s glossy screen, a different view shows that the plastic overlay didn’t appreciably interfere with viewing or controlling the display. I even finger-scribbled ATIS reports, transponder codes, and other information on the scratchpad in ForeFlight—a blank page intended for jotting such notes. I like the protection the flap offers, but you can tuck it away if it proves distracting. The front seats in my Bonanza feature high-density foam, so they’re a bit thicker than those with standard padding and upholstery. But in cruise flight, the iPad didn’t interfere with the yoke, even when it was tilted on the easel. I would, however, fold it flat when maneuvering and during takeoff and landing. I didn’t try flying an instrument approach on this trip, but I suspect I would fold the kneeboard flat during that critical phase of flight, too. My subscription to ForeFlight includes real-time tracking of my aircraft’s position on all charts, including instrument procedure charts and airport diagrams. I bought a Dual XGPS150A Bluetooth GPS receiver to supplement the built-in GPS in the iPad3, and that combination worked well. As the battery in the iPad ran down after some 6 hours of constant use, I turned off the XGPS150A to save the drain required for running Bluetooth. Even in the Bonanza, the iPad continued to show my GPS position, based only on the tablet’s internal receiver. I’ll test GPS reception on more flights. The press is abuzz with reports about the heat generated by the new processor in the iPad3. I checked the tablet periodically during the flight, and it definitely felt warm. The tilt-up easel on the ASA board, however, allows air to flow around the tablet and keeps it above your leg. Ambient temperatures were moderate on the day of this test flight, so I’m not sure if heat will prove an issue on warm summer days. The fabric ASA kneeboard tightly encloses the tablet, which might exacerbate any heating issues. Nevertheless, the iPad never complained or shut down. I had planned to fly the leg from Emmett, ID (S78) to Bellingham, WA (KBLI), via my usual route across the Cascades along V2 between Ellensburg (ELN) and Seattle (SEA). 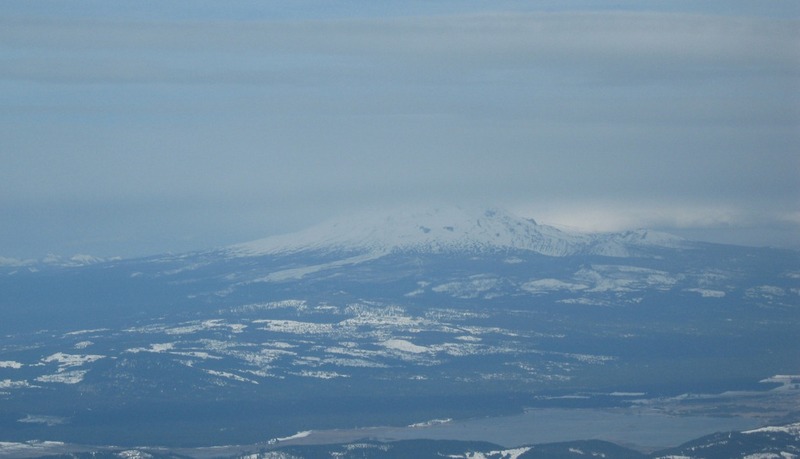 About 30 minutes after takeoff from S78, however, a check of the NEXRAD display showed rapid buildup of precipitation, including snow over the Cascades east of Seattle. I chose to turn west near Pendleton, OR (PDT) and follow the Columbia River through the gorge to the Portland area, and then turn north to KBLI. The seamless charts in ForeFlight, which you can zoom in for detail and zoom out for the big picture, made laying out the new route quick and easy. And the flight log immediately reflected the new ETE and ETA and fuel requirements for the longer route. With the new waypoints locked down on the chart, I could easily transfer the information to the GNS 530W and GPSMap396. The unexpected clouds and showers over the Cascades that prompted the reroute through the Columbia River gorge. I want to evaluate the iPad/ForeFlight combination on a few simulated instrument flights before I rely on it for actual IFR flying, but even after one test, I’m sold on the potential of electronic charts. On long flying days, I’ll have to swap among devices that run off the power outlet in the airplane to make sure that they all have sufficient power reserves during approach and landing. And I plan to continue practicing creating and amending routes, switching among chart types and procedure plates, and other essential tasks to make sure that flight operations become second-nature. But even after only one flight, I feel comfortable and reasonably proficient with the iPad and ForeFlight. I expect to become a 95 percent paperless pilot* soon. 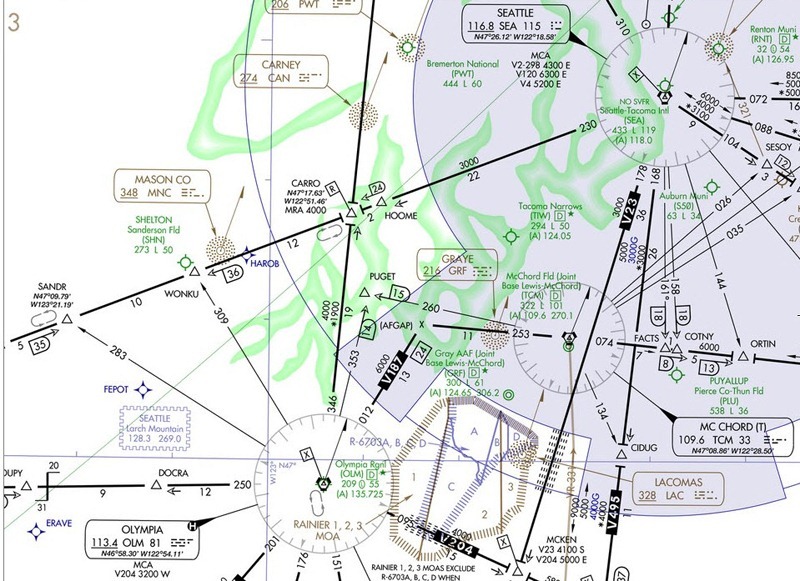 *I think I’ll always carry printed copies of a few critical approach charts on IFR flights. The webinar I presented earlier this week, “Using PC-Based Simulations to Complement Flight Training,” is now available as a video that you can stream from the EAA videos page. The video isn’t high-def, and the webinar hosting software that EAA uses doesn’t support videos and animations, but the presentation does give you an overview of my thinking about where PC-based simulations like X-Plane and Microsoft Flight Simulator fit in among the training and proficiency tools available to instructors and pilots. The presentation also describes how you can use PC-based simulations effectively as part of scenario-based training (SBT). 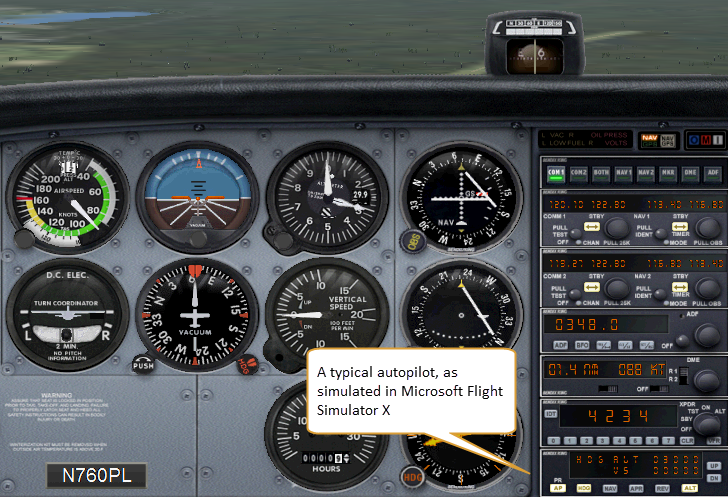 You can learn more about these topics in my new book, Scenario-Based Training with X-Plane and Microsoft Flight Simulator, published in January 2012. The FAA has published new editions of the basic manuals for aviation maintenance technicians–A&Ps. These books are great references pilots, flight instructors, and aircraft owners who want to know more about how aircraft and aircraft systems work. You can read a Q&A with me about Scenario-Based Training in the March 23, 2012 issue of the General Aviation News. To see the discussion as it appears in the print edition, follow this link and go to page 16. Or you can read a basic version here. One of the key items in the practical test standards (PTS) for the private pilot and commercial pilot certificates addresses a topic of an endless, often shrill, debate among pilots and flight instructors: the role of the autopilot. Partisans usually belong to one of two groups, (1) those who regard the autopilot as a crutch for lazy or unskilled pilots, especially in small, single-engine aircraft, and (2) pilots who consider it a key, if not essential, tool for safe, efficient flight, especially under IFR. I belong to group (2), with the understanding, of course, that aviators must always be able to fly without an autopilot (the gizmos do malfunction, and basic stick-and-rudder skills shouldn’t be allowed to atrophy). Explain how to recognize the current mode of operation of the autopilot/FMS. Explain how to recognize anticipated and unanticipated mode or status changes of the autopilot/FMS. State at any time during the flight the current mode or status and what the next anticipated mode or status will be. Use the autopilot/FMS to reduce workload as appropriate for the phase of flight, during emergency or abnormal operations. Programming. Especially when flying under IFR, changes to a route are inevitable. Even when the pilot is proficient in using FMS/RNAV, this task requires focusing some attention on the programming task. The FD/autopilot keeps the aircraft on the programmed heading or course and altitude while the pilot makes the necessary changes to the flight plan. If programmed correctly, the aircraft maintains the correct track and altitude. Distracting tasks/workload. Similarly, the FD/autopilot is used to control basic aircraft movement while the pilot focuses attention on tasks such as reviewing charts, briefing and configuring for an instrument approach, updating weather information, etc. The FD/autopilot can also be a great help in other high workload situations, such as flying in a busy terminal area or executing a missed approach in adverse weather conditions. Maintaining autopilot skills. 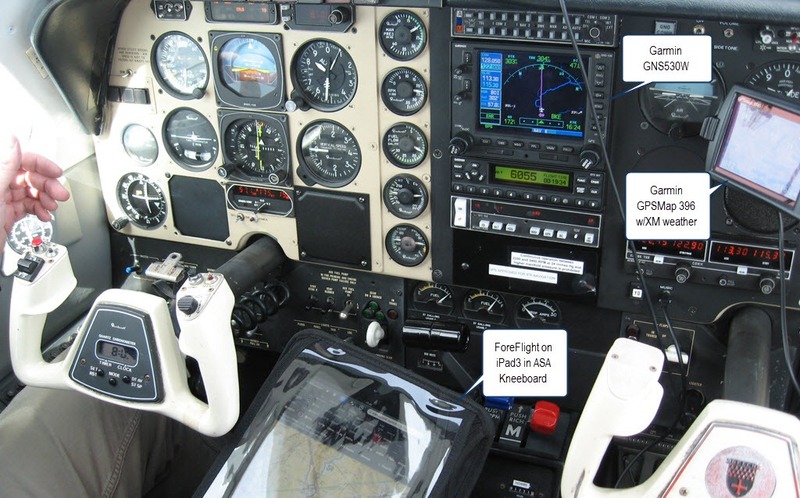 The FD/autopilot’s ability to help manage pilot workload depends heavily on the pilot’s proficiency in using it. Regular practice with the various autopilot functions (especially the approach functions) is essential to develop and maintain the knowledge and skills necessary to maximize its utilization. Finally, in a letter of legal interpretation (Murphy 2015), the FAA Office of Chief Counsel notes that the autopilot is essentially another flight control. Most instructors and pilots respect aviators who understand and make effective use of trim. We should encourage the same skills when we fly airplanes equipped with autopilots. The examiner shall evaluate the applicant’s ability throughout the practical test to use good aeronautical decision-making procedures in order to evaluate risks. The examiner shall accomplish this requirement by developing a scenario that incorporates as many Tasks as possible to evaluate the applicant’s risk management in making safe aeronautical decisions. For example, the examiner may develop a scenario that incorporates weather decisions and performance planning. The applicant’s ability to utilize all the assets available in making a risk analysis to determine the safest course of action is essential for satisfactory performance. The scenario should be realistic and within the capabilities of the aircraft used for the practical test. The emphasis on scenario-based training and aeronautical decision making complements the underlying themes of my new book, Scenario-Based Training with X-Plane and Microsoft Flight Simulator: Using PC-Based Flight Simulations based on FAA and Industry Training Standards. Even if you don’t use a PC-based simulation, you may find background information about SBT, FITS, and ADM helpful; the scenarios (30 for the private pilot syllabus, plus 18 in the IFR syllabus) may help you understand the key concepts and develop your own training challenges. Rich Stowell, the dean of stall/spin instruction for general aviation pilots, has prepared a great document for pilots interested in all-attitude flight training. Guidelines for Pilots Seeking All-Attitude Training (PDF) is available from the public documents page at the SAFE website. The document will help you evaluate training providers, and it answers many common questions about all-attitude training, which includes stall/spin/upset training, basic aerobatics, and emergency maneuver training.